Fingerprinting is one form of biometrics, a science which uses people’s physical or biological characteristics to identify them. Fingerprints are unique and never change, even as you get older, unless the deep or ‘basal’ layer is destroyed or intentionally changed by plastic surgery. This enables them to be used as evidence in a crime. There are three main fingerprint patterns – these are called arches, loops and whorls. It is the shape, size, number and arrangement of minor details in these patterns which makes each one unique. No two people have the same fingerprints; not even identical twins. When a fingerprint is found at a crime scene, this is known as a ‘finger mark’ or ‘latent print’. By cross-checking these against other prints in police databases, these prints have the potential to link a series of crimes together, or to place a suspect at the scene of a crime. Fingerprints can be taken either with an electronic scanning device or manually using ink and paper. A scanner is then used to save the data electronically in the appropriate format. While most national police have their own country database of fingerprints, INTERPOL has an international fingerprint database which we call the automatic fingerprint identification system (AFIS). Authorized users in member countries can view, submit and cross-check records of people, for example, where they suspect there may be an international aspect to the crime. The database contains around 185,000 records. The automated process means the database can make more than 1,000 comparisons per day. The system is also capable of searching and filing palm prints. Records are saved and exchanged in the format set by the National Institute of Standards and Technology (NIST). In 2018, our fingerprint database enabled 1,270 identifications worldwide. The exchange of forensic data in international investigations is a core, fundamental aspect of INTERPOL’s policing capabilities. Along with DNA, fingerprints can play an equally important role in identifying victims following natural or man-made disasters such as an earthquake or bombing. This is important not only for the police investigating the incident, but also for the families concerned. 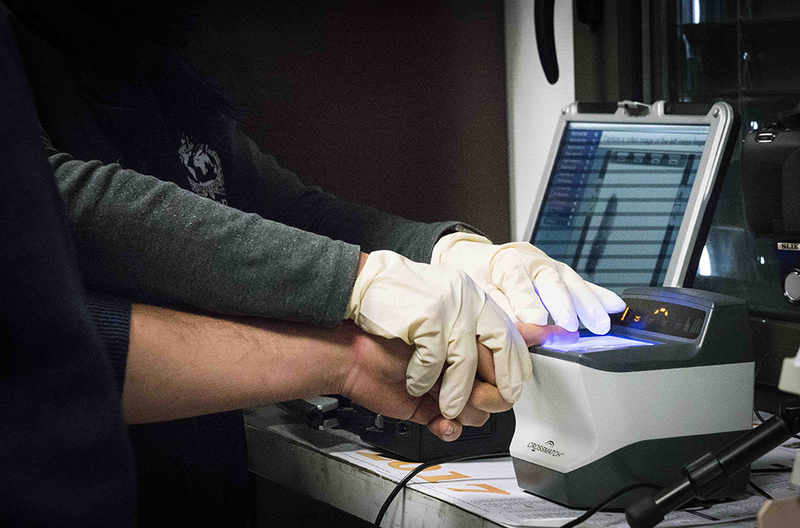 Held every two years, INTERPOL’s International Fingerprint Symposium provides an opportunity for experts from around the world to share best practice and latest developments. Since 2017 the symposium has included facial recognition specialists. An INTERPOL AFIS expert working group meets twice a year to share information on new technology, identification procedures and training needs. It also makes sure INTERPOL’s systems comply with the necessary standards. We also provide training to police in our member countries, to ensure that frontline officers have the knowledge and skills necessary to assess, preserve and share evidence in line with best practices.